1. Hero: a man admired for his achievements and noble qualities. 2. Martyr: a person who sacrifices something of great value and especially life itself for the sake of principle. Ryan Coogler’s award winning Fruitvale Station provides the audience with an Oscar Grant that by definition could not be described by either of these two terms. Let’s get this out of the way. Fruitvale is not a bio-pic. It is not a documentary. The film’s depiction of 22 year old Grant is a fictional one, a cinematic retelling based on the reality of this man’s life. A man’s life. That is exactly what is offered to the audience, a glimpse into the existence of one person before inevitable tragedy and the realization that there was a whole being tied to that name in the headlines. Fruitvale Station asks you to throw away your politics. The film wants us to face the simple truth that a man who was on his stomach, restrained, and cuffed was shot in the back without legal cause. Coogler’s debut ultimately is about moving an audience to think of and feel for yet another human life that ended too soon due to dubious circumstances. Yes, the movie at times sympathetically portrays Grant, but for all that sympathy it also actively works to show that he was no saint. Grant is shown as a “convicted” weed dealer, a cheater, and hot head. Does that sound like a biased representation? Coogler never justifies these flaws, but lets them sit there against Grant’s other character traits for the audience to judge. Grant has weaknesses, fears, and trouble maintaining a job. In other words, Grant is a human as flawed as the rest of us. Along with the bad there is of course good. He is depicted as a loving son, boyfriend (albeit not one free of temptation), and most importantly a father of a four year old child. Coogler shows that although Grant was not perfect, he was at the least a decent human being that regardless of his mistakes in no way deserved to die under those conditions. For a film in which we know the ending, it is surprising and a testament to Coogler’s storytelling how emotionally powerful this narrative is. “Highly emotionally affective” does not quite capture the way the film leaves you feeling. Don’t get me wrong. You will smile and lol as the majority of the story unfolds. Then there is the final act: Whispered sobs and sniffling broke out among the audience. As the credits rolled, the theater remained still. The inclination to clap seemed to be there (as this was a great movie), but then again you don’t applaud at a funeral. Fruitvale is not all just emotional storytelling. Coogler implements some thoughtful shots and aesthetic devices in the film. A found footage feel is created through the shaky cam and moments of what seem like candid dialogue add to the realism. The visual projection of Grant’s cellphone (his means to speak some of his final words) is inspired, consistently recurring as a motif signifying human connection. Many of the shots will be familiar to Bay Area residents. Bay Area culture is subtly threaded into the film’s fabric. From the use of “hella” to the inclusion of a song by a Bay Area rap artist that meant his own untimely death, Fruitvale anchors its personal story in the local life. Attentive viewers will hear the iconic howl of BART hauntingly scattered throughout Fruitvale. There is one particularly affective close-up of a BART train shuttering by as it takes off, the people behind the doors and windows swept into a blur. The camera tracks the train as it shoots into the darkness of the tunnel. Coogler lets the camera linger in this empty station, leaving the viewer with an eerie echo and thoughts of the impending death that shadows Oscar’s night out. The film isn’t perfect (damn near). There are a few minor lulls in the storytelling due to the “found footage” nature of the film. It also could be argued that Coogler can at times be heavy-handed in his sympathetic portrayal of Grant. However, it bears repeating that Coogler pays close attention to balance and character complexity. 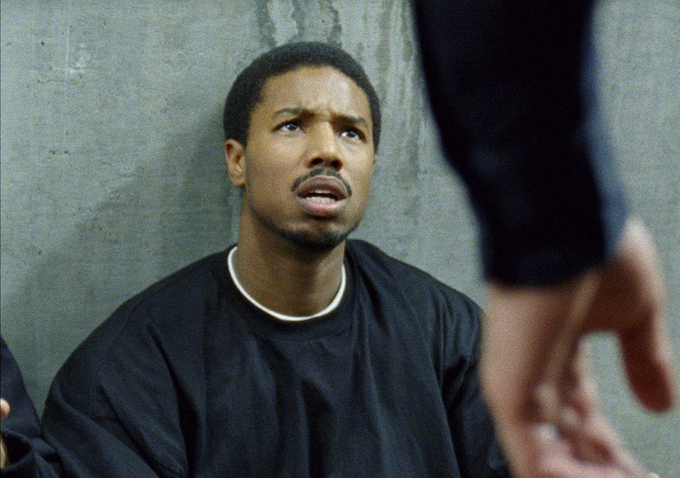 Insignificant imperfections aside, Fruitvale Station is a film that actually matters. After this summer of blockbusters, it’s revitalizing to see a film that is not about projecting our egos onto the adventures of some fanciful hero. Although primarily a work of fiction, Coogler’s film succeeds at giving us the reality of human relationships and human frailty. The coincidental timing is, of course, significant and the relevance of this release does not go unnoticed. Fruitvale’s greatest importance arises from the possibility that it may cause, if only temporarily, some to look at a black male in a hoody not as a threat, but as just another person trying to live their life. 1. Victim: one that is injured, destroyed, or sacrificed under any of various conditions. 2. Human: susceptible to or representative of the sympathies and frailties of human nature <such an inconsistency is very human — P. E. More>.